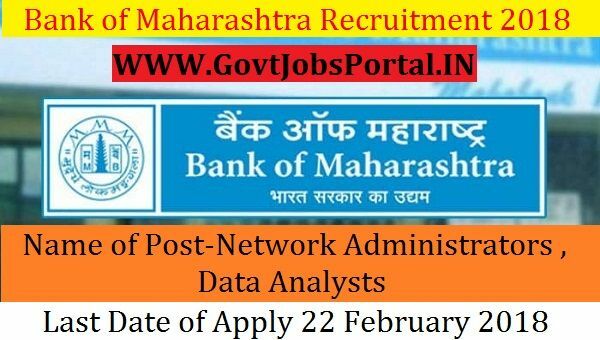 Bank of Maharashtra is going to recruit fresher candidates in India for Network Administrators , Data Analysts Posts. So, those candidates who are willing to work with this organization they May apply for this post. Last Date of Apply 22-February-2018. Total numbers of vacancies are 28 Posts. Only those candidates are eligible who have passed Master/Bachelor degree in the related areas like Statistics, Mathematics, Computer Science, Data Sciences, Analytics or related areas with minimum 55% marks or equivalent grade. Indian citizen having age in between 23 to 35 years can apply for this Bank of Maharashtra Recruitment 2018. Educational Criteria: Only those candidates are eligible who have passed Master/Bachelor degree in the related areas like Statistics, Mathematics, Computer Science, Data Sciences, Analytics or related areas with minimum 55% marks or equivalent grade. Age Criteria: Candidates age limit should to be possess minimum age 23 years & maximum age 35 years.